Definition at line 44 of file SundanceTrivialGrouper.hpp. Definition at line 48 of file SundanceTrivialGrouper.hpp. Definition at line 51 of file SundanceTrivialGrouper.hpp. 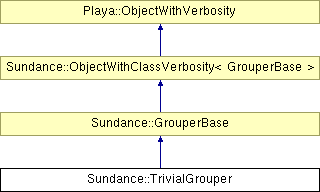 Definition at line 52 of file SundanceTrivialGrouper.cpp. References Sundance::EquationSet::blockForUnkID(), Sundance::EquationSet::blockForVarID(), Sundance::Map< Key, Value, Compare >::containsKey(), Sundance::GrouperBase::extractWeakForm(), Sundance::MultiIndex::firstOrderDirection(), Sundance::Map< Key, Value, Compare >::get(), Sundance::EquationSet::hasUnkID(), Sundance::EquationSet::hasVarID(), Sundance::GrouperBase::integrationVerb(), Sundance::MultiIndex::order(), Sundance::MultipleDeriv::order(), Playa::Handle< PointerType >::ptr(), Sundance::Map< Key, Value, Compare >::put(), Sundance::EquationSet::reducedUnkID(), Sundance::EquationSet::reducedVarID(), Sundance::GrouperBase::setupVerb(), SUNDANCE_MSG1, SUNDANCE_MSG2, SUNDANCE_MSG3, and Sundance::GrouperBase::transformVerb().